Another successful weekend of entertaining friends is in the books. With the help of my friend Stephanie, we kept it healthy this weekend. She is a nutritionist and my go-to girl whenever I am in need of some healthy advice that is realistic for a girl like me who isn’t about to give up my pizza nights. I definitely recommend checking out her site and signing up for her newsletter. This month it is all about sweeteners and as someone who isn’t a big fan of the artificial, I love her suggestions like puréed bananas. 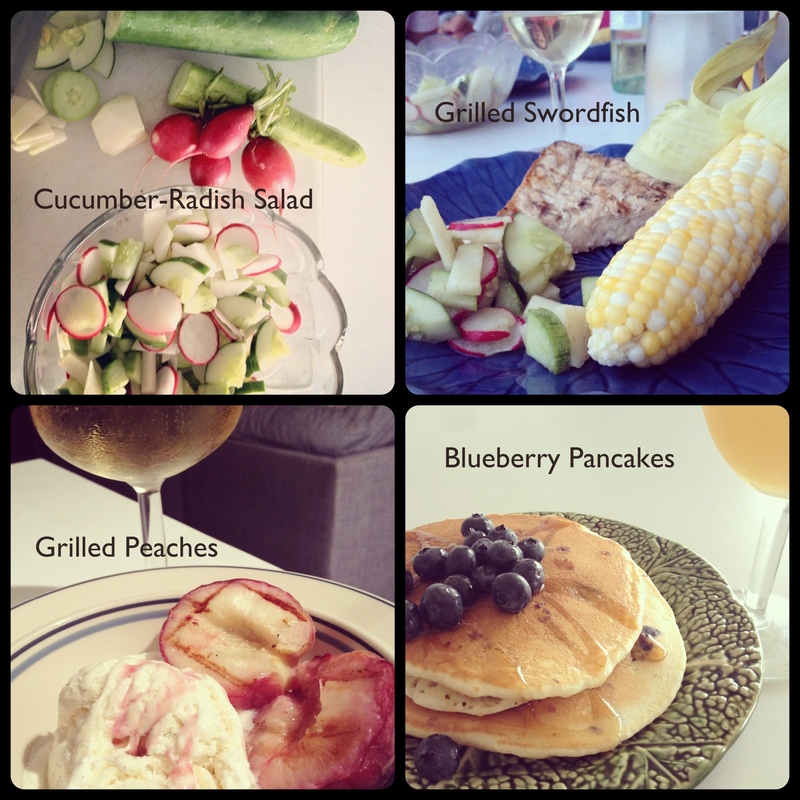 Back to the weekend, Stephanie and our guys pulled together a pretty fun menu from our finds at the farmers market. I was able to snap a few pics before toasting our glasses to a lovely weekend with great friends. Cucumber-Radish Salad: Both just looked too good to pass up, and a salad was the logical option. We topped with a scallion lime dressing also from the market. Grilled Swordfish and corn: The guys hit the grill with these lovely swordfish steaks and brushed them with a little bit of olive oil and salt. Perfection! For the corn we peeled back the husks and removed the silks then peeled the husks back into place and soaked in water for 20mins. Placed on the grill for approx. 20mins. They were so sweet and tender, no need for butter. Grilled Peaches and Vanilla Ice Cream: This was a no brainer. The guys went back out the grill after dinner with a plate of halved peaches and a little bit of butter, they came back with pure heaven. We popped the champagne and with a few scoops of vanilla ice cream dessert was complete. Blueberry Pancakes: My favorite breakfast when entertaining. Pancake mix, fresh blueberries, syrup, and a mimosa. Done. We also has some leftover bananas and added a few slices which is a great combo. Previous PostBeach Weekend…Here We Go!